Stems scrambling to climbing with tendril-like petioles and leaf-rachises, 4-5 m or more. Leaf blade odd-pinnate, usually 5-foliolate; leaflets deltate to ovate, strongly 3-parted to 3-cleft, proximal leaflets sometimes 3-cleft, 1.5-5.5 × 0.5-4.5 cm, membranous to leathery; segments ovate, deltate, or linear, margins dentate; surfaces pilose, abaxially more densely so. Inflorescences usually axillary, 3-12-flowered simple cymes or compound with central axis or flowers solitary or paired. Flowers unisexual; pedicel slender, (1.1-)1.5-7 cm; sepals wide-spreading, not recurved, white to cream, oblong or elliptic to obovate or oblanceolate, (7-)9-13(-15) mm, abaxially and adaxially pubescent; stamens 40-90; filments glabrous; staminodes 17-35 when present; pistils 35-90. Achenes elliptic to ovate, 3-5 × l.5-2.5 mm, rimmed, short-silky; beak 4-9 cm. Flowering spring-fall (Mar-Oct). Chaparral, xeric scrub, oak scrub, and grasslands; pastures, fencerows, and other secondary sites; often along streams or on slopes; 0-2200 m; Ariz., Calif., Colo., N.Mex., Okla., Tex. ; n Mexico. 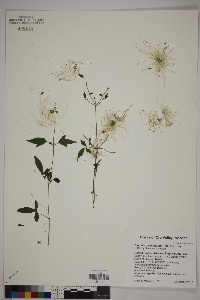 As with many other members of the subgenus, the leaves of Clematis drummondii are reputedly used in a poultice to treat irritations of the skin in humans and other animals. 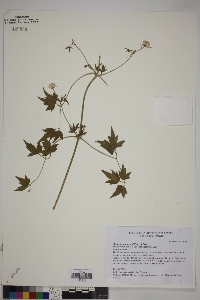 Clematis coahuilensis D. J. Keil is found in central and north-central Mexico in habitats similar to those of C. drummondii ; it is distinguished by ovate, entire to 3-lobed, leathery leaflets.